But which one gets the job done fastest? 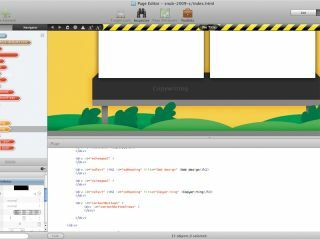 Which Mac application is best for wannabe web designers? The web has come a long way in a short space of time. Today, many people live huge amounts of their lives online, engrossed in social networking, consuming news and media, and shopping via thousands of online retailers. Although the likes of Flickr and Facebook can provide you with an online home of sorts, they're akin to renting a flat from a really strict landlord. You can hang your pictures on the wall, but can't do anything about the décor – and knocking down some walls is totally out of the question. However, create your own website and you can do whatever you like with it. Unfortunately, web design can be complex, and although online website creation services exist to lend a helping hand, their interfaces are often alien, and working online can be slow, due to connection speeds. Also, many of these services churn out unimpressive results. Instead, you're better off working with a dedicated desktop-based application, and we've brought together six leading Mac-based examples for this group test. Since this test is centred around beginners, we're placing firm emphasis on usability and speed. We'll look at how easy the tools are to use, and whether any bundled templates are visually pleasing, flexible and relevant. And we'll also find out whether our half-dozen chosen apps are suitable for getting galleries, blogs and more online with the minimum of effort. There's stark contrast between the user-friendly apps on test and those that are more impenetrable. Of the latter, Freeway Express and Flux want to be QuarkXPress and Coda, respectively, and are too complex for beginners, while ShutterBug's esoteric interface is hard to love and often unforgiving. At the other end of the scale, iWeb is a huge success. It's everything you'd expect from an Apple application – the clean interface, with large icons, straightforward sidebars and usable inspectors, is a joy to use. iWeb is very occasionally awkward, but mostly works in exactly the way you'd expect, and in a very 'Mac' manner. Sandvox is similarly accessible and intuitive, aping iWeb's clean, efficient style. RapidWeaver also takes a modern Mac-like approach, and is mostly intuitive, despite offering more under-the-hood power than iWeb and Sandvox. However, we weren't keen on the split between editing content and visual previews, preferring the 'live' editing of the other leading apps. Unfortunately ShutterBug and Freeway Express offer rather dated templates, but the other four applications provide a good, varied and modern selection. Although some templates are more specific and limited than others, every one of these applications provides at least a handful of smart generic themes that you can use as the basis for a wide variety of sites. With the exception of Flux and Freeway, themes are switchable, and iWeb curiously enables you to apply an individual theme to each page. iWeb, RapidWeaver and Sandvox also go the extra mile in another way, providing pre-set page types, such as galleries and blogs. iWeb makes more effort regarding interesting layout variations (Sandvox and RapidWeaver's are more rigid and uniform), but lacks a contact-form page type. Some customisation is also available, although complex templates often suffer when tinkered with. RapidWeaver's ability to save custom styles for templates is welcome, however. When it comes to helping photographers Flux and Freeway Express do very little, and RapidWeaver also disappoints in this area. Although it integrates nicely with iPhoto, the resulting galleries are divorced from the layout, and RapidWeaver's Flash slideshows aren't terribly impressive. Sandvox also comes a little unstuck — although gallery setup is simple (drag and drop from the Media palette into a Photo Album page) and display options plentiful, the resulting galleries are dull. For images, iWeb's the clear winner. Integration with iPhoto is first rate, and plentiful options for gallery layout and thumbnail decoration are provided and easily applied. The optional slideshow is also impressive. However, ShutterBug comes a close second. Although it can't complete with iWeb regarding gallery appearance, ShutterBug betters it in slideshow functionality, even offering a LightBox overlay option when thumbnails are clicked. Both it and iWeb also provide tools for fine-tuning images.